Happy November! Fall is my favorite time of the year. The colors, the spices, and the pumpkin! Oh, and my wedding anniversary! Shannon and I just celebrated our second wedding anniversary. She's an inspiration in my life and in this recipe. Shannon is one of those girls that Buzzfeed makes fun of that buys pumpkin everything. But, I have to admit, I'm a "basic bro." I could eat pumpkin pie every. single. day. 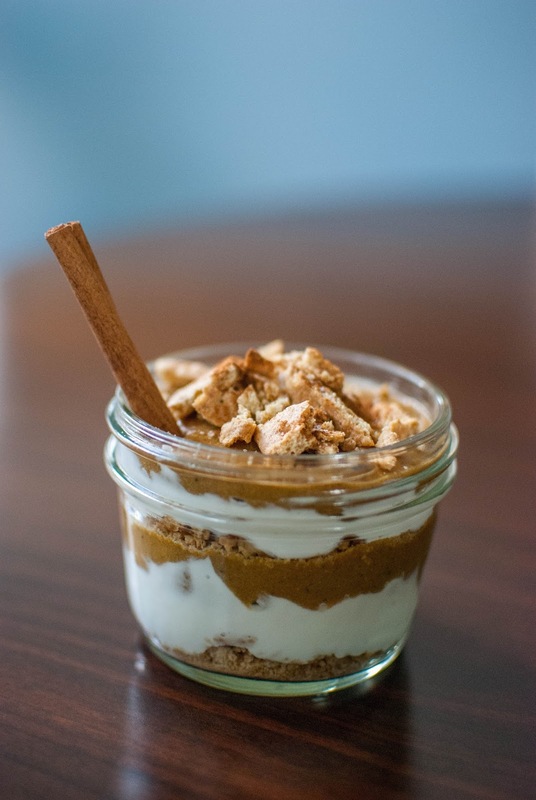 My pumpkin pie filling uses a mixture of pumpkin puree and blended chickpeas for a nice dose of protein, fiber, and vitamin A. These parfaits are great to make ahead in small mason jars and eat on the go. When I'm running late in the morning and rushing to catch my bus, I grab one of these to make my 1 hour commute a bit more enjoyable.